Try a Shot of frameworks Canada! If you want to give the quality of your Canadian address database a boost, but don't want to commit to an annual subscription, frameworks Canada is also available as a 'Shot' for use over a shorter time period. 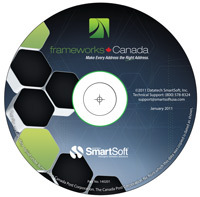 With the frameworks Shot you enjoy the power of our high-end frameworks Canada address accuracy software application whenever you need it. Plus, if you decide to upgrade to the full annual subscription of frameworks Canada within 4 months of purchase of the frameworks Shot, we'll discount the purchase price from your annual subscription! A Shot of frameworks Canada costs just $395, or $495 for our Mailers Edition. For more information on the frameworks Shot, please contact us.